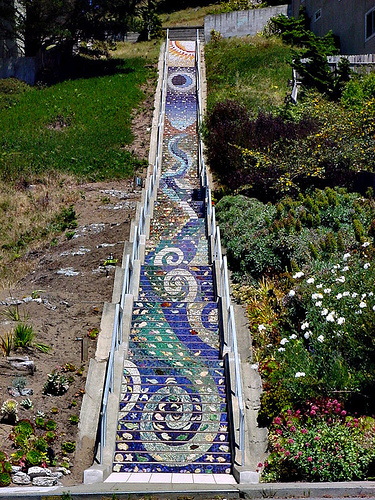 Walking up and down the ceramic-tiled Hidden Garden Steps and adjacent garden in San Francisco’s Inner Sunset District on a daily basis brings at least three words to mind: opportunity, imagination, and joy. There is that daily reminder of the opportunity provided by a volunteer-driven community-based coalition that was strongly supported by colleagues in the Street Parks Program, a wonderfully supportive collaboration between the San Francisco Department of Public Works and the San Francisco Parks Alliance. There is the tremendous manifestation of imagination displayed by project artists Aileen Barr and Colette Crutcher through the mosaic they created for the site. And there is the sheer joy of seeing a long-ignored space brought back to life not only through the work of Hidden Garden Steps organizing committee members, but also by the numerous volunteers and donors who supported—and continue to support—the project, and the presence of people who increasingly are arriving from places all over the world to visit and enjoy the serenity as well as the camaraderie that comes when people meet, talk, dream, and share a space they treasure. It isn’t all that much different than what I find in the best communities of learning to which I’m drawn. We are united by a common (learning) goal and benefit from each other’s company over long periods of time. So when I read the sentence “Cities should provide and people should have access to opportunity, imagination, and joy” in Allan Jacobs’ The Good City: Reflections and Imaginations recently, I felt as if the world of city planning, park (particularly street-park and parklet) development, and learning had all come together on the pages of an inspiring and engaging book. 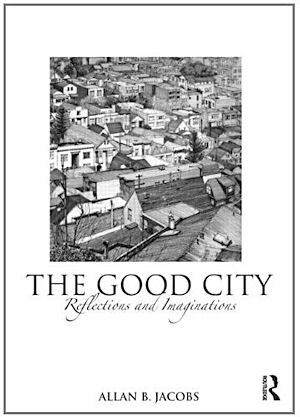 Jacobs, former director of the San Francisco Planning Department and a University of California, Berkeley professor emeritus, covers a lot of ground in a book comprised of essays and short stories. Beginning with a description of two years he spent in India as an urban planner working under the auspices of the Ford Foundation, he leads us through a series of vignettes that ultimately are connected through the theme of how community and collaboration does or does not develop in a variety of settings including Cleveland, Curitiba, Pudong, Rome, Tokyo, Toronto, Vancouver, and, in the final sections of the book, San Francisco. His work is firmly rooted in what many of us fascinated by cities and community development have found in books by Jane Jacobs (The Death and Life of Great American Cities), Christopher Alexander (A Pattern Language: Towns – Buildings – Construction; The Timeless Way of Building; and just about everything he has written since then), William Whyte (City: Rediscovering the Center), Peter Harnik (Urban Green: Innovative Parks for Resurgent Cities), and many others who have written thoughtfully and in depth on what makes our cities work. When he turns his attention to San Francisco, he obviously delights in exploring the themes of opportunity, imagination, and joy. There are his recollections of how he and his City Planning colleagues engaged community at a grass-roots level: “we called well-advertised meetings, often by delivering notices to all individual mail-boxes, to get people together for an effort or to confront an issue” (p. 143) just as Hidden Garden Steps volunteers began the project with face-to-face, door-to-door conversations with neighbors close to the proposed project site, and followed those efforts up with numerous postings of flyers in neighborhood businesses and bulletin boards in addition to online contact using social media platforms. 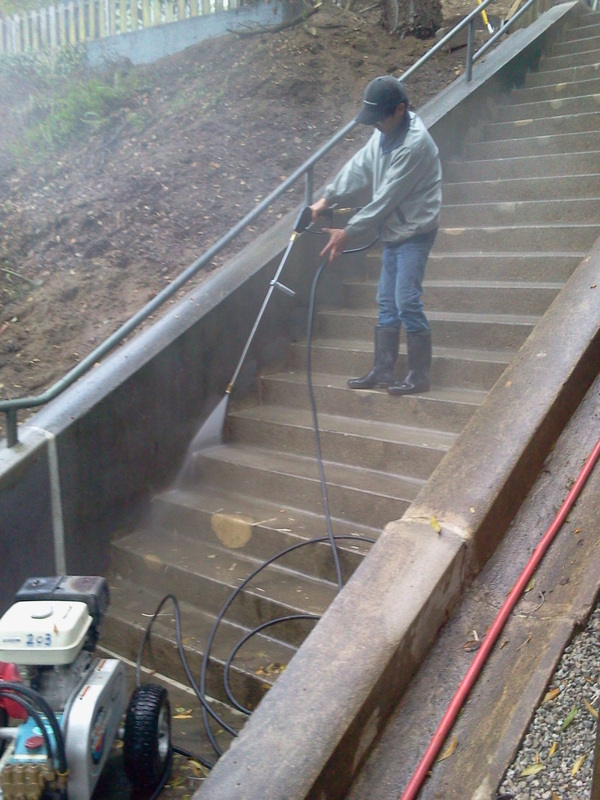 Jacobs acknowledges seeing “our role as the professional staff as partners of people more than as facilitators” (p. 145)—something that increasing numbers of training-teaching-learning colleagues are embracing in the work we do, and something that is at the heart of all the positive experiences Hidden Garden Steps volunteers had (and continue to have) with our San Francisco Parks Alliance, Department of Public Works, and other City/County colleagues. As I’ve noted many times, our successful partnerships never descended into us-and-them disputes; we were unified by a common goal and that’s what held and holds us together. Jacobs notes the dramatic results achieved through various partnerships: “The most positive, dramatic change to San Francisco over the last 30-plus years is the northern and northeastern waterfront, from the Golden Gate Bridge to the kids’ mini-baseball diamond-park at McCovey Cove, a distance of about seven miles. Crissy Field, a gem of a restoration area, part of the Golden Gate National Recreation Area, has rightfully become a huge draw for walkers, cyclists, skaters, picnickers, fishermen, beachgoers, naturalists, people of all ages, and dogs….” (p. 160). 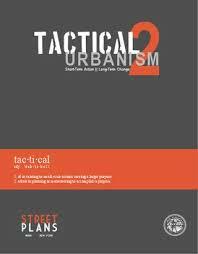 He could have just as easily been talking about the smaller-scale Tactical Urbanism efforts that fuel San Francisco’s Street Parks projects when he discusses the changes that make our—and any—city great. He weaves the various and varied themes together as he nears the end of The Good City when he describes what that city would include: “there would be opportunities to learn and to work, to earn one’s livelihood; and places to get to with ease, places for social interaction or just to see other people, or places to be alone; and opportunities to participate in local decisions; and places for fun” (p. 176)…“People should feel that some part of the urban environment belongs to them, individually and collectively, some part for which they care and are responsible, irrespective of whether they own it. The city environment should be one that encourages participation….The public environment, by definition, should be open to all members of the community. It is where people of different kinds meet. 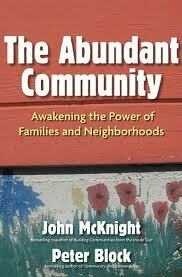 No one should be excluded unless they threaten the balance of that life” (p. 178)—all of which, to me, just as accurately describes what is foundational to great communities of learning. Perhaps this is why so many of us are drawn to learning; to great cities; to parks and open spaces; and to libraries, museums, and so many other community resources: they share an all-important link—the magic that happens when opportunity, imagination, and joy bring us together to form, interact in, and sustain great communities that bring rewards far beyond any others we can imagine. They connect us to our past, through our present, and into a future we may not be around to see, but know will be much better for the contributions that we make to it. N.B. : Previous articles about the Hidden Garden Steps remain available on this blog. Although I did not, last Saturday, expect to find myself joining others in singing “Deck the Halls” at a memorial service, I also didn’t expect to be saying good-bye to Patricia Vanderlaan Post so soon—she died of heart failure on January 1, just a few weeks before her 62nd birthday. Patricia—Pat or Patti to those of us who knew her—was one of those wonderful people who are so deeply immersed in our communities that we hardly notice how much they are doing until they are no longer there doing it. Others at that memorial service last weekend recalled how Pat volunteered at her daughter’s school, or opened her home to a student from Kosovo for six years, or was an active member of The Gratitude Center community. We heard about how she “took delight in children of all ages, and worked to promote their welfare and education,” how she “was an ardent supporter of empowerment for women and social justice” and once told her stepdaughter that she would buy her any CDs she wanted—as long as those CDs featured women musicians to augment a CD collection mainly comprised of music by men. She quickly won my gratitude and admiration when, after joining the Hidden Garden Steps organizing committee to complete that project that placed a second ceramic-tile mosaic staircase and gardens here in San Francisco’s Inner Sunset District, she offered to do anything that would help move the project toward fruition. She wasn’t looking for anything glamorous; she just wanted to help where help was needed most. When she asked how she could be most useful, I provided an embarrassingly honest answer: we needed someone to sit with me for an hour or two to complete the application for permits needed before installation of the mosaic could take place on City and County of San Francisco property. I knew that if I didn’t have someone to work alongside me, I would continue procrastinating about completing that simple task. It wasn’t that the paperwork was daunting, and it wasn’t that deadlines were looming before us. The real issue was that other committee members were too immersed in the short-term challenges and deadlines to spend time on preparing permit paperwork for an installation that was still at least 12 to 18 months away; the fact that the application process could take anywhere from six months to a year from submission to approval just wasn’t a compelling issue for most of us to address. But Pat saw it. She got it. And, most importantly, she immediately set a specific time and day to sit with me so we could complete that fairly simple application and compile all the supporting documentation needed to start the application process. While others saw it as a distraction and as something that had no urgency, Pat and I completed everything in one afternoon, and I submitted the package to our City/County liaison a few days later, in November 2012. And when final approval was finally granted by our County Supervisors in October 2013—nearly a year later, and less than 48 hours before the installation was scheduled to begin—I couldn’t find enough words of praise to offer Pat for the underappreciated role she played in assuring that the mosaic went onto those concrete steps rather than having to sit in storage all winter and spring until we could be assured of having weather good enough to complete the installation process in 2014. Those of us involved in the project saw Pat at other times. 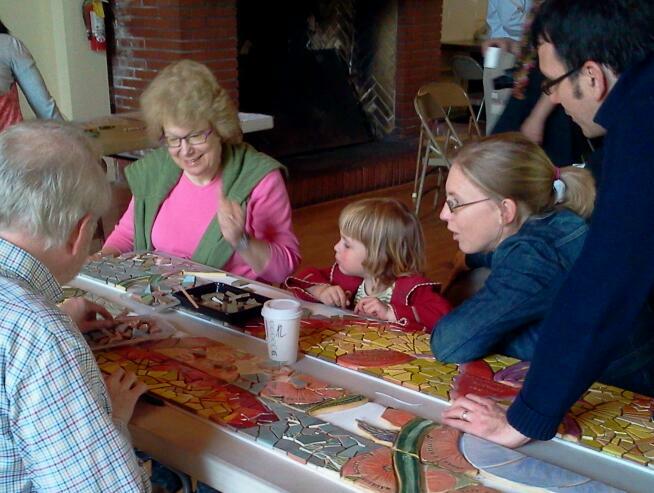 She was there to help with public workshops that allowed Steps supporters to create small parts of the mosaic under the direction of project artists Aileen Barr and Colette Crutcher. 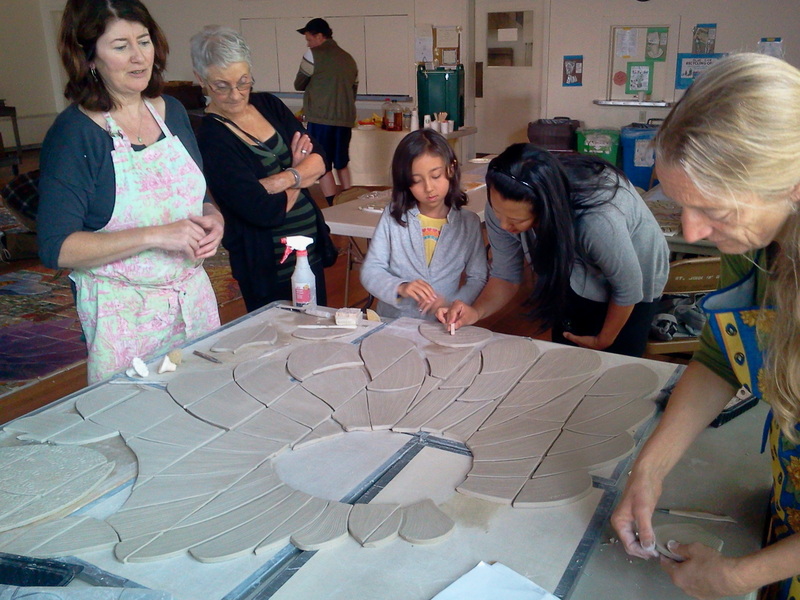 She joined others in laying background tile onto some of the Steps risers during those workshops. And my wife and I ran into her and her husband—Marty—a few times while all of us were taking walks along one of the small lakes in Golden Gate Park at dusk; we would stop, chat about the Steps and other things we were all doing, and look forward to the day when we would be celebrating a collaborative community success on the completed Steps themselves. We never had the chance to have that onsite Steps celebration together. By the time we had our opening ceremony, in December 2013, Pat wasn’t well enough to join us. I did, on the other hand, feel as if the decision to celebrate her life and her spirit by singing “Deck the Halls” at her memorial last weekend made perfect sense after her husband explained that it was her daughter’s choice—in honor of Pat’s habit of singing her children to sleep throughout the year with “Deck the Halls” rather than something more mundane. After all, “mundane” is not a word to be connected to someone who so gracefully, charitably, and diligently worked to make her community a far better place than it would have been without her. 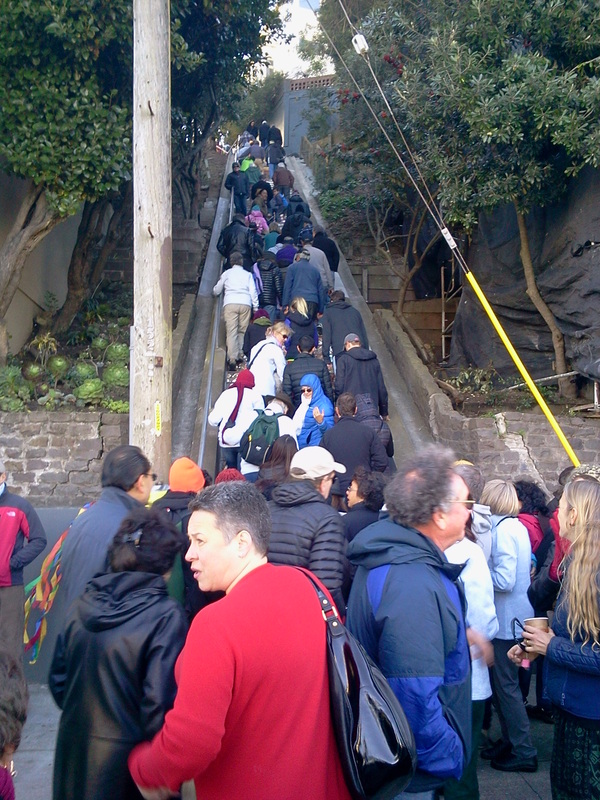 The following is a slightly-edited version of comments delivered during the opening celebration for the Hidden Garden Steps on Saturday, December 7, 2013; the Steps are located on 16th Avenue, between Kirkham and Lawton streets, in San Francisco’s Inner Sunset District. We struggle—all of us—so much these days with simple concepts like community, collaboration, cooperation, faith, and love. Hard to define. Even harder to develop. And yet there it is: the Hidden Garden Steps, an example of what community, collaboration, cooperation, faith, and love can produce. 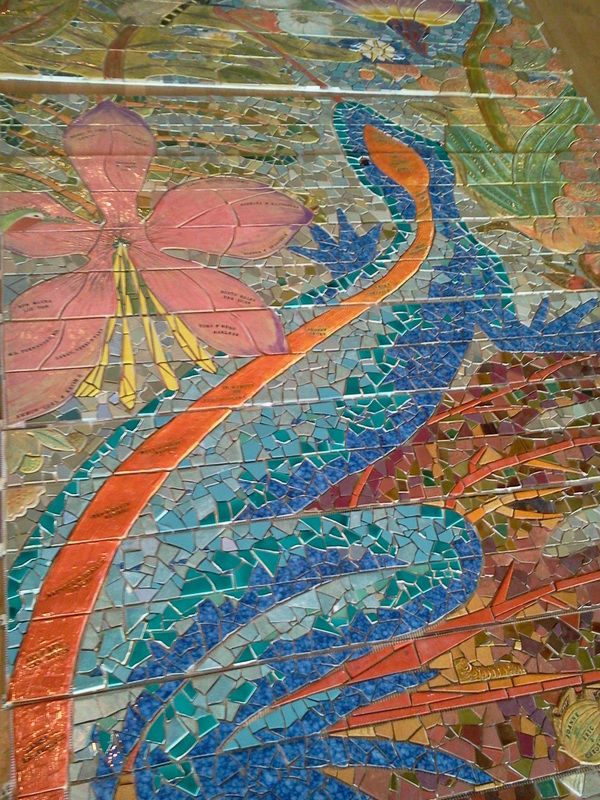 One of the most beautiful aspects of that spectacular mosaic by Aileen Barr and Colette Crutcher is what it documents. Adam Greenfield, president of the Inner Sunset Park Neighbors, said two nights ago that communities coalesce around the stories they create and share. And there it is. Adam’s idea incarnate. A complex, beautiful, and enticing mosaic capturing a from-the-heart piece of our community’s narrative. The Steps have more than 600 individual names or inscriptions from donors in California and 14 other states (Alaska, Florida, Hawaii, Idaho, Illinois, Louisiana, Minnesota, New Jersey, New York, North Carolina, Oregon, Pennsylvania, Texas, and Washington), from Washington, D.C., and from four countries outside of the U.S. (Canada, France, Germany, and the United Kingdom). Aileen and Colette have seamlessly woven them into the overall design—a design that is the latest addition to the narrative of the Inner Sunset District, its residents, some of its former residents, and its visitors. It’s also part of the extended narrative of San Francisco and our connections to communities around the world, across decades and centuries. We—all of us, all of you—are living proof of what happens when people set egos aside and come together to create something of lasting value. Something we will enjoy and know that those here long after we are gone will enjoy as well. You can’t go more than a few steps up that site without seeing the narrative come to life—for example, when you see Edith Johnson’s name. Edith, who is nearly 100 years old and has lived here longer than many of us have been alive. You go a little farther and maybe you see the name of someone’s pet that is no longer with us. Or you see your own name, or the names of family members, friends, and neighbors. And about two-thirds of the way up, where the Steps bend to the left around a larger landing, you see a massive passion flower—another reminder of the passion that drives this project and our community. That passion flower is what we call our “Gratitude Element.” It documents our gratitude for the many organizations and businesses that came together to bring the Steps to life. For those who grumble about government and government workers, there’s the reminder that our partners in the San Francisco Department of Public Works fell in love with this site as they worked on it with us and made it far better than any of us dreamed it could be. It’s not “DPW” as some bureaucratic entity; it’s DPW made of people like Ray Lui, Kevin Sporer, Bill Pressas, Nick Elsner, and all the staff they sent our way. 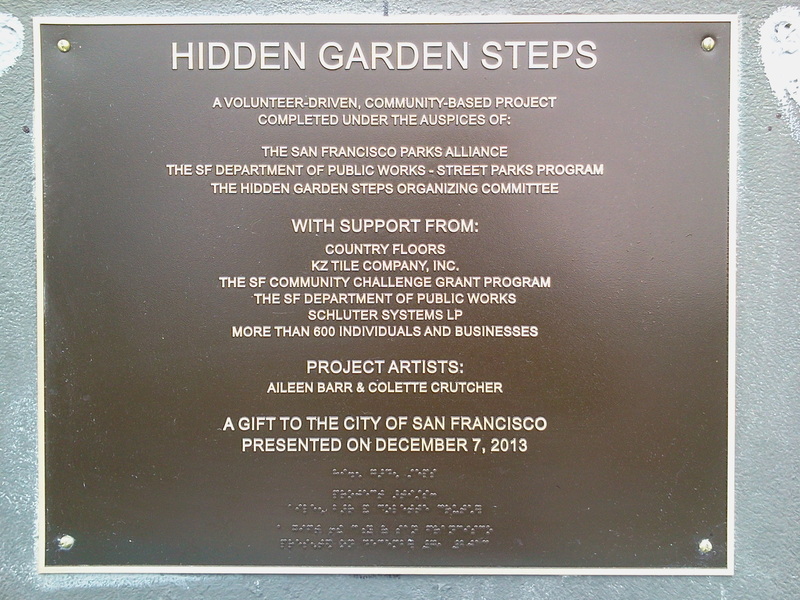 For those who forget that there were already many community-based organizations active in our neighborhood, there’s the documentation that they came together under the Hidden Garden Steps banner. The San Francisco Parks Alliance supports us as our fiscal agent. The San Francisco Department of Public Works Street Parks Program provides us with tools and other materials to cultivate the gardens. Those gardens initially began to grow from donations from neighbors as well as from volunteers from Nature in the City’s Green Hairstreak butterfly project—which now is a more extended habitat than before because the Hidden Garden Steps site extends it a bit farther north, toward Golden Gate Park. There are our neighborhood associations—SHARP (Sunset Heights Association of Responsible People), the Golden Gate Heights Neighborhood Association, and the Inner Sunset Park Neighbors (ISPN). If you want to see how much ISPN members contribute to the neighborhood, join them—more members of our community—tomorrow on Irving Street between 9th and 10th avenues from 10 am to 6 pm for their final street fair/community gathering of the year, and the community potluck they are hosting next Tuesday evening at St. John of God community center at 5th and Irving. For those who have little opportunity to interact with our elected officials, think of the people you see here today as well as former District 7 County Supervisor Sean Elsbernd, and those magnificent legislative aides (Alex Volberding and Olivia Scanlon) who so frequently helped connect us to supportive colleagues within City/County government. And Katie Tang, who as a legislative aide to Carmen Chu did all she could to draw positive attention to the Steps—and continues to do so now in her position as a County Supervisor with her fabulously helpful legislative aide Ashley Summers. And going back to Sean Elsbernd: think about how he agreed to use a neighborhood beautification fund to cover more than $7,000 in City/County permits before the project could be brought to completion. You walk those Steps and you see the names of the members of the project’s core organizing committee—no more and no less visible than the names of others who supported the project. Not set apart, but integrated into the community that we so obviously cherish. There are local merchants like Majed Fakhouri, who by hosting three events for project organizers and supporters at his Crepevine restaurant on Irving Street, provided a place for us to meet and eat and organize. There’s Sam and his brothers at the 828 Irving Market, who kept our promotional brochures prominently displayed in the market window for nearly three years as we continued to reach out to the community for financial as well as volunteer support. And there are Chris and Nick at the 22nd and Irving Market who did the same in their part of the neighborhood so no interested neighbor would remain unaware of what we all were proposing to do together. But that’s far from the complete story. The narrative we’re helping extend includes people like Maya, who was born on January 24, 2010—five days before the Hidden Garden Steps project was born as a result of an unplanned meeting in a branch library on the other side of town. Maya is growing up as the Steps are growing up. 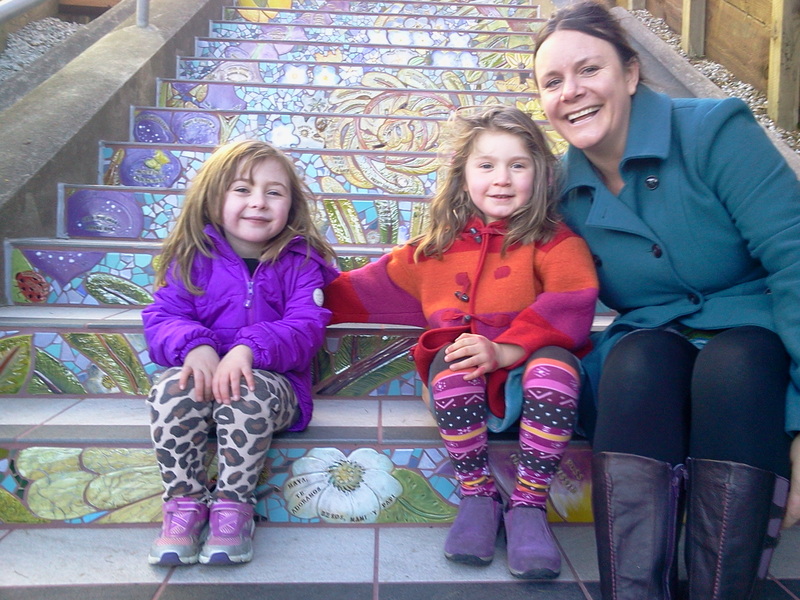 The mosaic on the Steps is an integral part of her life, and she has a tile that will remind her that she and her parents were here when it all was being built. If we’re lucky enough to keep her here in the neighborhood, she may extend the narrative herself if life leads her to raising her own family in a home not far from the Steps. So many stories. So many additions to the narrative of our community and connections everywhere. Let’s give credit where credit is due. Please applaud yourselves. All of you. For all you did to make this happen. And remember that in many ways this is neither an ending or a beginning. It’s part of an amazing level of continuity that all of us will help sustain as we continue meeting here on the second Saturday of every month from 1- 3 pm. To sweep. To weed. To plant. To paint out any graffiti placed by those who don’t understand what adds to community as opposed to what detracts from it. But most of all to relish the community we have joined and continue to develop. Our work together doesn’t have to take place just one time a month. We’re part of a community if we remove litter anytime we find any on the Steps. We’re part of a community if we remove graffiti whenever it appears. We’re part of a community if we come out on our own time and sweep a bit when it is needed. We’re part of a community if we kindly and openly and graciously approach people who may forget that people sleep at night in the buildings next to the Steps and are disturbed by loud conversations or impromptu parties. We’re part of a community if we ask those engaged in any other type of disruptive behavior to join us in making this a warm, welcoming, inclusive area for all who want to be part of our community. It’s up to us to add to that narrative. N.B. : This is the twenty-second in an ongoing series of articles to document the Hidden Garden Steps project in San Francisco. While driving from San Francisco to Seattle several years ago, I learned an important lesson: we diminish ourselves, our communities, and the power of the collaborative process by ignoring the people who produce all that surrounds us. The lesson came during a visit with Licia’s (my wife’s) aunt (Dorothy) and uncle (Woody). It was as Woody was describing some of the roadwork he had overseen while working for Caltrans (the California Department of Transportation) that I realized how little thought we give to those who, like Woody, literally make our world look and work the way it does. He mentioned one 18-mile stretch as a particularly challenging project; told us how he had worked with colleagues to design a solution that was not only utilitarian but actually, in many ways, aesthetically pleasing; and told us that we would be driving over that extended length of road on our way back to San Francisco. When we reached the beginning of what we now think of as “Uncle Woody’s Road” (with no disrespect intended toward all of Woody’s wonderful collaborators who were important partners in completing the project), we slowed down. Paid attention to what he had described. And afterwards thought about how many other people’s work we failed to acknowledge. As a colleague once noted, “everything was designed by someone,” but we take this aspect of the world around us for granted. 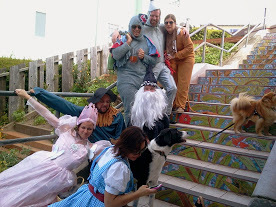 Which is not the case for those of us involved as organizing committee members on the Hidden Garden Steps project here in San Francisco’s Inner Sunset District. We’re aware of the more than 500 people—primarily from the San Francisco Bay Area, but also including people from nine states as well as from the United Kingdom and France—who donated more than $200,000 in cash and substantial amounts of volunteer time to support the creation and installation of the 148-step ceramic-tile mosaic created by project artists Aileen Barr and Colette Crutcher and currently being installed by KZ Tile employees on the Hidden Garden Steps site (16th Avenue, between Kirkham and Lawton streets). We’re becoming familiar with Kai, Michael, and the others from KZ Tile who are working to complete the installation before the rainy season begins. 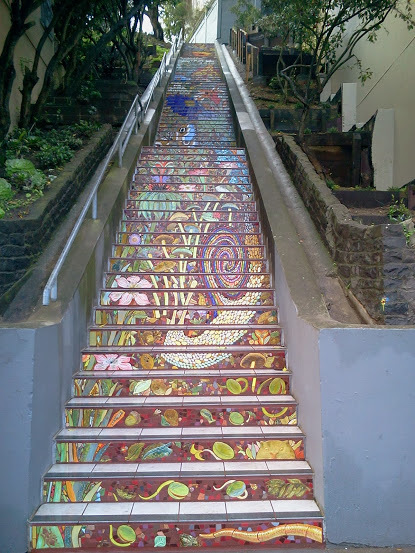 We know the numerous San Francisco Department of Public Works employees who removed a broken concrete retaining wall and out-of-alignment flight of steps so the mosaic could be correctly and safely installed. 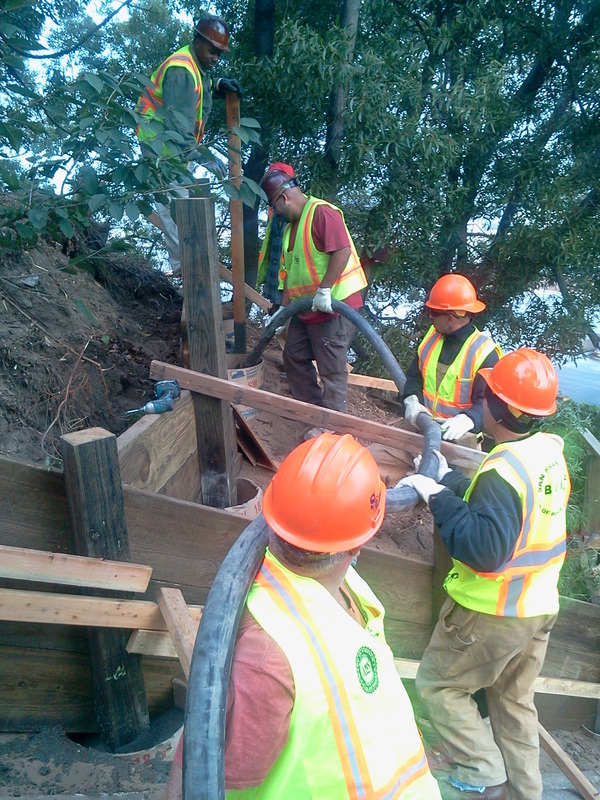 We know Hector, Sean, David, Neil, Francisco, and so many others who have dug holes, built terraces, poured and hand-troweled concrete, and shoveled dirt from one side of the hill to the other—and then back again—as massive erosion-control efforts were completed onsite. We know Ray and Bill and Kevin and Nick and so many others who worked from their offices and make onsite visits to move the project along and make it far better than any of us ever envisioned it being. We know Olivia and Alex and Ashley and Katy (now herself a county supervisor), who as legislative aides to members of the San Francisco Board of Supervisors did the underappreciated and rarely acknowledged work of connecting us to those within the City and County of San Francisco who needed to be part of transforming the site into something attractive and of value to those in the immediate neighborhood as well as to those from all over the world who come to San Francisco to see those wonders that just seem to spring up on their own. Because the project had two major and very ambitious goals—create a second set of ceramic-tile steps and public gardens here in the Inner Sunset District and further strengthen the sense of community that already exists here (we have at least three neighborhood associations, a merchants association, a weekly farmers’ market, several schools, a University of California campus, numerous churches, and a very active café and restaurant scene that provides plenty of third places for us to gather, relax, exchange ideas, and occasionally find ways to make the community even more appealing and cohesive)—we have also come to know many of the neighbors and organizations we didn’t previously know. Nurturing the Hidden Garden Steps as an inclusive project, we drew community members together to participate in the creation of parts of the mosaic, continue to attract volunteers on the second Saturday of each month from 1 – 3 pm to clean up the site, nurture the gardens-in-progress, and do whatever is needed to make this into another fairly unusual third place for community interactions and engagement. We have been active on the ground—sometimes going door to door to keep neighbors up to date on what we’re doing—as well as online (through our website, newsletter, @GardenSteps Twitter account, Hidden Garden Steps Facebook page (which received its 200th “like” earlier this week), and numerous other social media platforms. And yet even with all that connectivity and collaboration, we know there will come a time when we will no longer be here. Others will walk up and down those stairs. Work on those gardens. Have conversations which will not include us. Stop long enough to think about the fact that people just like them made the Hidden Garden Steps possible. And then be inspired, as we were by the original set of tiled steps here in the neighborhood, to engage in that level of community-building, collaboration, and transformation themselves. N.B. : This is the twenty-first in an ongoing series of articles to document the Hidden Garden Steps project in San Francisco. Parents certainly have an inkling of what they are doing when they select something along the lines of Royal Forest Oakes (a college classmate I hadn’t thought about in years until I began writing this piece) or Sandy Beach (a cherished friend who is probably only half joking when she claims to be one of the few people who would be ecstatic about acquiring a four-syllable Japanese surname through the act of marriage rather than keeping her considerably shorter maiden name). Fundraisers intuitively understand the importance of what we call “naming opportunities” when placing donors’ names on buildings, concert halls, museum galleries, special-interest centers in libraries, or something as unusual as the 148-step ceramic-tile mosaic that project artists Aileen Barr and Colette Crutcher are a breath away from completing for installation on the Hidden Garden Steps site on 16th Avenue, between Kirkham and Lawton streets. Starting with the generic “Kirkham-16th Avenue Mosaic Steps” designation as a placeholder, we tossed ideas around for months as we designed and planned for implementation of the fundraising and marketing efforts capable of igniting the enthusiasm and support needed to bring a $300,000 volunteer-driven community-based project to fruition. As the time to create a project website as well as design and print marketing materials approached, we finally engaged in the hour-long exercise that produced the name that stuck. What did begin to take shape was a set of options that focused on the potential beauty to be carved out of the long-neglected site; the idea that there was something capable of drawing members of our extended community together through creation and maintenance of a new neighborhood focal point; and the obvious project elements of art, ceramic tiles, gardens, and steps. By eliminating the less-descriptive words, the name “Hidden Garden Steps” more or less presented itself as the now-inevitable choice. It didn’t, during those initial moments of discovery, inspire the sense of enthusiasm we were seeking—but then we did a reverse two-minute timed exercise which required only that everyone toss out every image that the name suggested to them. When responses along the lines of “a children’s fairy-tale garden,” “something mysterious that reveals more of itself the more it’s explored,” and “art and gardens and community,” we could feel our mood shifting. The name started to become something that actually helped transform the idea of the Hidden Garden Steps into concrete elements that we wanted to create through a combination of the ceramic-tile mosaic; the gardens that would feature succulents, California natives, and other drought-tolerant plants; and any murals we added to the existing graffiti-tagged walls along the site. The name, in essence, had already begun to transform the project by making us more aware of what we were potentially in a position to develop. Our intention has been consistent: to create a cohesive project where the mosaic, the gardens, and the murals were so carefully interwoven and dependent upon each other that it would be impossible to imagine the site without all three of those elements present. And yet the mosaic has been the obvious focus of attention all along—until I saw that photograph last night. 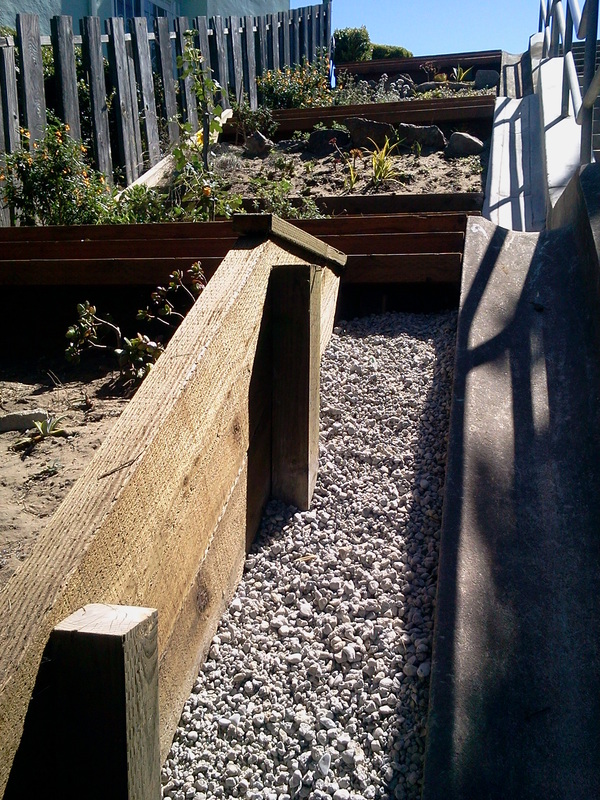 It’s a simple, unremarkable image: a close-up of newly-installed gravel in a narrow space between a drainage gutter and the terraced garden along the top third of the Steps. But as I looked at that gravel, how it complemented the Steps, and how it added to the beauty and called a bit more attention to those still partially-hidden gardens, I realized I was beginning to think of the name in a much more expansive and cohesive way than ever before: it was as if the “hidden garden Steps,” with an emphasis on the steps, had grown into the richer more nuanced possibilities suggested by the capitalized, equally-weighted words “Hidden,” with its implication of something wonderful waiting to be discovered; “Garden,” which contains the living thriving plants reflected within the design of the mosaic itself; and “Steps,” the platform upon which we will walk and from which we will admire that stunningly beautiful mosaic as it reflects a dynamic artistic vision of the life and community that will continue to develop around it in the years and decades before us. N.B. 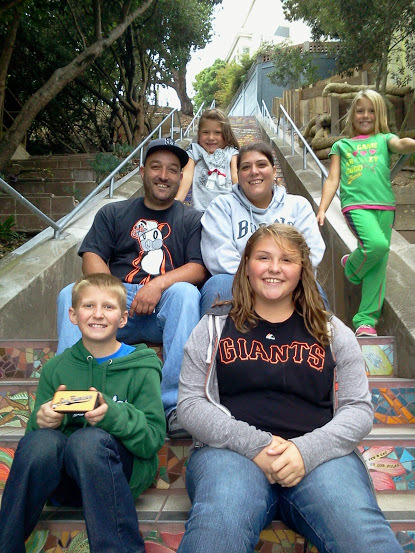 : This is the twentieth in an ongoing series of articles to document the Hidden Garden Steps project in San Francisco.